For some mothers-to-be pregnancy is a dreamy time of happy anticipation and nesting. For others it is much more challenging – whether because of juggling extreme tiredness, morning sickness, work, the needs of existing family or all of the above! I found this so challenging in my first pregnancy and when I was a ‘new mother’. In pregnancy we often feel we have to keep going regardless of the messages our body may be giving us to slow down. Try to find time in the day to rest, even if you are at work – download a Yoga Nidra recording onto your MP3 players (try Guided Relaxation from Sharon Gannon at www.jivamuktiyoga.com) and lie down somewhere quiet to listen to it in your lunch break. If you are pregnant and working try not to overschedule your evenings and ‘down time’. The more you rest now the more you are building reserves in the energy bank for those challenging first few months of motherhood. This is such a cliché but nonetheless it’s true! It’s so very easy to wish pregnancy away. We’re anticipating meeting our little one for the first time, we may be feeling pretty yucky, and towards the end most women experiences a desire to ‘get this baby out of me! !’ that’s a sure sign labour will be coming soon. Amidst all of this try to take time to smell the roses. Pregnancy is a unique and precious experience and even if it’s challenging you won’t always be feeling the way you do. In our busy lives we often forget to ‘check in’ with how our bodies are feeling and even how we’re doing emotionally. Pregnancy might be a great time to start a journal or treat yourself to a regular massage or set up a meditation routine. However you do it it’s important to take time to connect and ‘just be’. Many studies have shown that pregnancy women who do this adjust to motherhood more easily. Especially towards the end of your pregnancy take some time out to spring clean your home, make your environment beautiful and nurture yourself. Get a good friend to help you. Set up your kitchen with teas and herbs that will nourish you post-natally (when it might be harder to get out to the shops). You might also want to consider the beautiful ritual of having a ‘Blessingway’ around this time. Read ‘Mother Rising: The Blessingway Journey into Motherhood’ by Yan Cortlund for more information. In the yoga tradition there is no word for ‘guilt’. I mean that quite literally – in the ancient Indian language of Sanskrit there is no word that directly translates as ‘guilt’. Instead the idea of actions and consequences or results is emphasized. Guilt is a phenomenon of the developed world and also one that is quite linked to my generation of parents I think. It’s almost as though we have too many resources and too much information and no matter what you do there is a voice out there somewhere (or a little voice inside your head) saying you could have done differently and usually better. This as true of the journey of pregnancy as it is of the journey of parenthood. Give yourself a break! No good comes of feeling guilty especially when you are doing your absolute best in a situation. Katie Manitsas is the author of ‘The Yoga of Birth’ and director of Jivamukti Yoga Sydney. She is mother of two young boys and a practicing doula. Katie runs a weekend workshop twice a year, also called ‘The Yoga of Birth’, which trains yoga teachers to teach pre-natal yoga. The training is taught by Katie and several guest teachers all of whom are leaders in their fields related to childbirth. If you attend the training a copy of the book is included free of charge. The next training runs August 24th and 25th 2013. Details can be found at www.jivamuktiyoga.com.au or email katie@jivamuktiyoga.com.au. For anyone wishing to start practising yoga, it can be quite daunting. Many questions can come up, such as “Is yoga right for me?”, “Which yoga style should I choose?”, “How will I know if I am doing it right?”, etc. Yoga is the art of controlling our body and mind. Developed in India over many years, it is now available all round the worlds. With life getting more and more complex, it is a very effective way to add some relaxation and calm into our busy lives. Here are some suggestions which may assist you in starting your yoga practise. 1. TRUST YOUR INNER JUDGEMENT. We sometimes forget to listen to that quiet voice inside ourselves that knows when something is not right for us. When it comes to choosing a style of yoga, a studio or teacher – go with your gut feeling. It is alright to let the yoga studio or teacher know that you are just checking out what feels right for you. This is especially appropriate during a yoga class if you feel really out of place or where the postures are too hard for you. Listen to that voice – you can always come back to the class at a later date. 2. BE POSITIVE ABOUT YOURSELF. We all have inner conflicts at some time or another – that is just part of being human. When you catch yourself in this state, try focusing on something positive you want from the yoga practice, or give yourself a pat on the back for coming in the first place. Never lose your patience – just being in the yoga class will have a relaxing calming effect on you. Also let the yoga class do the work for you (go along with the flow) rather than putting pressure on yourself about whether you are doing it right. You will be surprised by the results. 3. CHECKOUT YOUR LOCAL YOGA STUDIOS. Most of us will have at least 1-2 yoga studios in their local area. You may also find that your local community centre may have yoga classes run by local teachers who don’t belong to a studio. Attending a local yoga class in their area is the best way to learn the basics. If you don’t have any local yoga studios, there are a range of yoga classes available online from MP3 audios to DVDS. We have a range of high quality MP3 audio classes from experienced yoga teachers. Two of the best programs for beginners are Vinyasa Hatha Beginners Complete Set (Classes 1 to 6) and Hatha Yoga for Beginners Complete Set (Classes 1 to 7). They are designed for anyone who is new to yoga and wants to learn the basics. 4. PRACTICE REGULARLY. When you start yoga, we recommend that you commit to doing it at least once a week for 4-6 weeks. When you start something new it often takes at least 4 weeks to get used to it. Signing up for a beginners program is often a good idea as they typically run for 6-10 weeks and are aimed at your level. 5. BUY YOUR OWN YOGA MAT. Having your own yoga mat is a really good idea, and they are pretty inexpensive. Often studios will provide mats, however it is much better to have your own for hygiene purposes. It is also a great item to have around your home if you want to practice at home. 6. IT’S ALL ABOUT YOUR BREATH. The busier we get, the more we need to breathe. Physical, emotional and mental tension is usually accompanied by shallow breathing. At the heart of yoga is the idea that every pose / movement / action you do should be complemented by slow deep breathing. Studies have shown that Olympic rowers can improve their performance by up to 10% by using slow deep breathing. All it takes to use your breath is a little awareness of when you are holding your breath and focus on deepen and slowing your breathing. Give it a try and see whether you can feel any difference. You may also find it useful during your yoga classes. Coincides never cease to amaze me. My focus for the past 9 months has been on my pregnancy – I had a beautiful baby girl (Alexandra Imogen) earlier this month. I thoroughly enjoyed practising prenatal yoga throughout my pregnancy, and highly recommend it to any pregnant woman after their first trimester. Preferrably, find an excellent teacher in your local area. This is a great way to meet other pregnant women and share experiences. When I was feeling really uncomfortable about something, it was good to find out that someone else was feeling the same way as me. (If you can’t make it to a class, check out our online pre-natal classes). Just when I was due to give birth, Australian Yoga Journal magazine decided to put together an issue focusing on prenatal yoga — we are once again featured in their November 2012 (in news agents now) — the magazine includes a complimentary 65-minute Prentatal Yoga Class CD, led by one of liveyogalife.com’s most popular teachers, Ana Davis. Ana Davis is an international yoga teacher based in Byron Bay. She has been teaching for 16 years and is the director of Bliss Baby, which specializes in prenatal and postnatal yoga training. Ana is also a senior yoga teacher at the Byron Yoga Centre where she lectures on yoga for women’s health as part of their teacher training programs. This 65-minute Prenatal Yoga Class is the 1st in a 7-set-series of classes. The 7-class-set has been designed to be accessible throughout the different stages of pregnancy. It covers the fundamentals of posture & breath-work, poses for birth-preparation, lateral stretches & hip-openers, energy-building, core & sacral stability for birth, and restorative sessions for those tired days. For more information, check out Ana’s complete series of classes here. Ana also has an 8-class-set of 20-minute Postnatal classes for after you have given birth — excellent for regaining your fitness, stability and stamina. Check out the complimentary class in this month’s issue of Australian Yoga Journal magazine, available at your local newsagent today! Check out our latest release – Hatha Yoga Intermediate Series Class 1 to 6 by Vinyasa Hatha yoga teacher, Daneille Dolev. The set of classes primarily focuses on improving your strength, stability, concentration and balance with a special focus on the flexibility of your hips. Danielle specialises in designing beautiful flowing classes with an emphasis on working with your breath. Class 1: Focuses on improving your strength, balance and concentration. It has an emphasis on a flowing practice where you move smoothly between postures while working with the breath. Class 2: Focuses on improving your strength, balance and concentration. It has an emphasis on the therapeutic benefits of flowing movement where you move smoothly between postures while working with the breath. Class 3: Focuses on improving your strength, balance and concentration. It also has a strong emphasis on the therapeutic benefits on flowing with the breath. Class 4: Focuses on developing your strength, balance, hip stability and opening through your hips. It has an emphasis on a flowing practice where you move smoothly between postures while working with the breath. Class 5: Focuses on improving your strength, balance, concentration whilst opening your hips. The flowing practice has a strong emphasis on moving with the breath. Class 6: Focuses on improving your strength, stability and balance whilst opening the hips. Danielle designs beautiful flowing classes with an emphasis on working with your breath. These classes are intermediate level (also suitable for advanced beginners) and available separately or as a complete set of 6 classes. NOTE: These classes do not come with printable PDF visual guides. In 2005 I had the pleasure of attending a workshop that opened my eyes to how I could be living my life better. It posed the idea that if we are honest with ourselves, we may find that our lives are not turning out how we wanted them to. If this is the case – it went on to ask what exactly is getting in our way? The course then used some simple examples to show that we think way too much and that this is what gets in the way. Basically we visual everything that can go wrong, and are not surprised when everything wrong does happen. At this stage you may be thinking that the workshop would be a bad idea – all it would do is make me feel embarrassed or silly for not being in control of my life. Funnily I left the workshop feeling the exact opposite – that I had the tools to make significant improvements in how I lived my life. After attending the course, I searched for blogs and articles to expand what I discovered at the workshop. One of the best articles I found was by Steve Pavlina and was title “the courage to live consciously”. If this topic interests you I would recommend reading it – click here. PS. The workshop was called the isa Experience. We are once again delighted to be featured in the August / September 2012 issue of Australian Yoga Journal magazine. 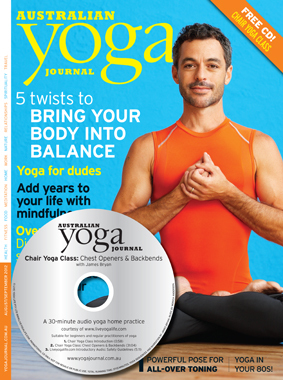 The magazine comes with a complimentary CD featuring a 30-minute Chair Yoga Open Level Class by one of Australia’s most experienced teachers, James Bryan. James teaches at the Knoff Yoga School in Cairns with Nicki Knoff. In this class (Chair Yoga Level 2 Class 2 – Chest-Openers & Back Bends), James expertly guides you through postures that work on releasing the shoulders, opening the chest, and releasing tension and strengthening the lower and upper back. Once again, these focus points are high-lights to a complete and whole-body exercise. These are a series of four guided classes that builds on the Level 1 Program with stronger and deeper physical exercises involving standing-up and using your chair either for support or for stronger and deeper stretches as a prop.